The First Academy that was approval by DGCA in all Streams with its own Heavy Aircraft with Jet Engines and Helicoptor for Training in Various Streams. While the aviation sector needs all the professionals to do their part to keep travel safe, the AMEs probablyperform one of the most crucial functions. Every aircraft has to be certified safe by an AME before it’sallowed to fly. The responsibility to maintain the aircraft and its engines rests with technical engineers,technicians and mechanics who work in airlines and maintenance-repair-overhaul (MRO) facilities. The course is structured with both theory and practical training. 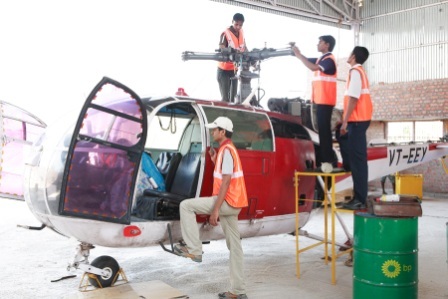 Of the total practical training, 30% practicaltraining is imparted at Air India MRO facility. Candidate has a choice between Mechanical (or B1) and Avionics (or B2). There are total 11 modules for B1 and 10 modules for B2. No efforts have been spared to lay the infrastructure for this prestigious course on a second base. Apart from the lecture halls for theory classes, spacious workshops exist which house the various laboratories provided with appropriate assemblies and components, spares and test equipment’s, working models and demonstration items, charts and diagrams, together with Audio Visual aids offering latest documentation along with computer knowledge and skills. Actual flying exposure is given to students for better understanding of systems. A team of qualified and experienced teaching staff headed by Chief Instructor will impart the training. Presently Flytech Aviation Academy has a tie up with Air India Engineering Services Limited or AIESL (ie the aircraft maintenance division of Air India) located at Rajiv Gandhi International Airport, Shamshabad (Hyderabad) for imparting practical training required under CAR 147. Students also get practical training exposure on light aircraft at Flytech’s DGCA approved maintenance facility. Internal: Academy conducts internal examinations in theory and practical in each module. DGCA exams : Directorate General of Civil Aviation (DGCA) conducts module examinations thrice a year. The first eight examinations cover basic modules i.e Module 03 to Module 10. There after students can appear in specific module examinations - chosen from module 11 to 17 - depending on choice of category. At the end of the courses, student obtains a Basic Certificate of Recognition, with which he can enroll with an airline or MRO and gain work experience as mandated by the DGCA. Airlines and MROs provide the mandatory practical work experience, after which the candidate can get a basic license, called a Category A license. If a candidate wishes to specialize in one type of aircraft then he or she will have to clear the experience and test requirements applicable for B1 or B2 license. A candidate can, in fact, even aim towards achieving both B1 and B2 licenses! While an AME’s salary varies from airline to airline, the job pays Rs.60,000 to Rs.70,000 a month appx for starters. For an AME with a B1 license and experience, the sky is the limit – with salaries as high as Rs.2 to 3 lakhs per annum. India’s aviation industry is largely untapped with huge growth opportunities, considering that air transport is still expensive for majority of the country’s population, of which nearly 40 per cent is the upwardly mobile middle class. In the coming 20 years, Indian companies are expected buy 2,100 new planes worth US$ 290 billion. Also, domestic air traffic in India is expected to cross 150 million in FY19-20, on the back of unprecedented capacity induction by airlines. Students of AME course can also appear and qualify as AMAeSI (Associate Membership of Aeronautical Society of India) which is fully recognised by Government of India / State Government / Union Public Service Commission (U.P.S.C.) / G.A.T.E. for M.Tech admission / Hindustan Aeronautics Ltd., (H.A.L.) / Indian Airlines / Air India / B.H.E.L. / D.R.D.O. / N.A.L. / I.A.F. / Coast Guard / Airline Industries etc. / Birla Institute of Technology, Ranchi / Madras Institute of Technology and many other Government, Public and Private sector as equivalent to B.E / B.Tech (Aeronautical Engineering).